Leaders in the 21st Century are at a loss. The old models are failing us everywhere and no clear direction is emerging to guide future leaders in ways that sustain and nurture them. Increasingly people are working at the grass root level to shape their futures. Such grass root leaders of course often draw upon old models of leadership and run the risk of becoming the mirror of the forces they are challenging. Increasingly however, a new form of leadership is emerging.Such leaders have clear values, a moral and inclusive vision of the future and a sense of hope. They also have skills in terms of knowledge relating to the systems available to them in the world to achieve change and the creativity to think beyond systems when they constrain our capacity to achieve just and sustainable outcomes for their communities, for the planet and for themselves. The Leadership Matters workshop scheduled for November 14-17 is a four-day process that takes attendees through exercises that will enable them to reflect on their values, vision and sources of hope. It will also look at the knowledge-base for successful leaders in the 21st century. To be most effective most quickly you need keep four wheels turning simultaneously: your self- knowledge and broad general knowledge; how views about how the world works shape what people believe and do; the quality of your relationships with others; and various tools to sustain your personal learning and to improve the capacity of sustainability-literate action in others. Ultimately, your learning should translate into your own distinct leadership model or ‘persona’ which guides your behaviour and the actions you take. This workshop series explores leadership as an art form which engages us both as individuals and also communities. It moves through four stages looking at leadership contexts, exploring tools for leading (and following), recognises that leaders are many and varied and that understanding our leadership style is key to facilitating strong compassionate leading and turns finally on the last day to the calling of leadership in the 21st Century. 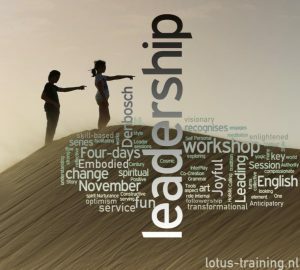 The workshop recognises that leadership has a spiritual dimension and that this element of leadership is often not recognised in leadership studies. Consequently, this workshop brings in specific terms from the yogic tradition to stimulate reflection on leading. It also includes daily meditation sessions to charge our days with a spiritual flow. One aspect that is key to this workshop series is the role that the collective plays in leader development. Positive leadership works on developing one’s internal reflective abilities along with a deep commitment to serving the world. Change-makers with a strong inner calling.